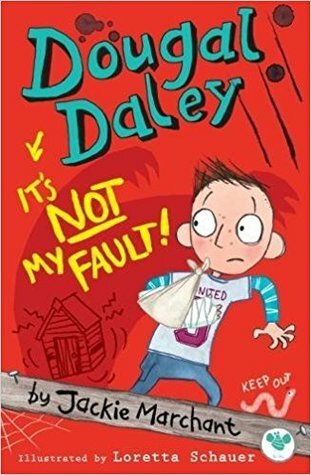 Dougal Daley; It’s Not My Fault! I, Dougal Daley, am dead! Ok I m not actually dead. But if I m not careful I soon will be. In this first book, football-loving Dougal Daley finds himself at risk from the mysterious creature living in the garden shed. Nobody believes him but as a precaution, he sets upon writing his will – rewarding those who help him and disinheriting those who get on his bad side. Meanwhile, as limbs and windows alike are broken by rogue footballs and unhinged canines, Dougal finds himself in all sorts of trouble. . .and NONE of it is his fault! I read this book in one sitting. It was funny, addictive and emotional too. I really felt for Dougal throughout the story. The whole narrative worked really well and I am one hundred percent sure that any kid who reads this book will also agree. From parents and sisters who don’t listen to you and blame you, to friends who get caught in the middle of things, this book is full of real-life situations surrounding a very hilarious thing. I loved the ending of the book too. This whole book is full of personality and I cannot wait to read the next one! The best character is actually one that I can’t really talk about without completely and utterly ruining the story – I know, right? – So instead I will talk about my second favourite character; Dougal. He’s a really interesting character to read about. A true klutz who has a great voice too. I am definitely intrigued to see what happens to him in future books! Definitely! Especially to any kid aged between 6 to 10 as they’ll really enjoy everything that happens. The book is written in a diary format with a few chapters that are notes from other characters all intermingled with amazing illustrations which really helps to make this book readable, addictive and fun – everything that books for children should be! If you or your child is looking for a fun and funny book that is similar to the Wimpy Kid books, make sure you give this book a try! A really fun and kid friendly book that has a brilliant main character and a story that is full of personality and creativity.